Difference between revisions of "Tip of the Day"
You can contribute to the Eclipse Tip of the Day framework. More about this later. 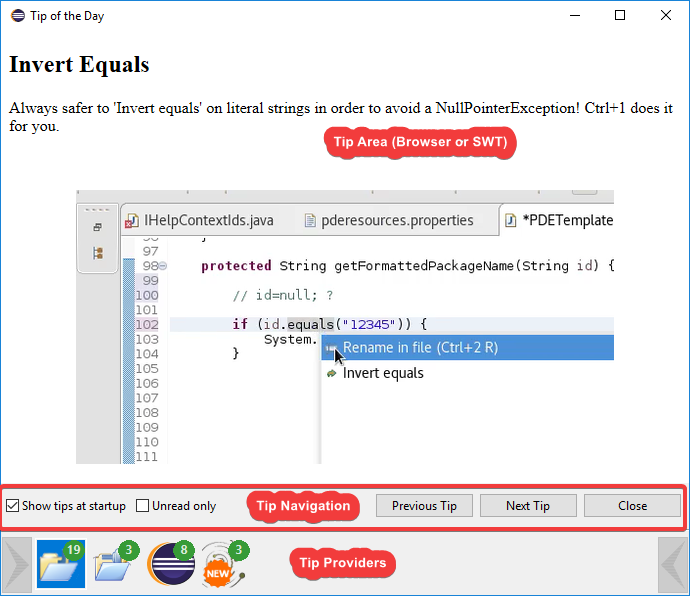 The Eclipse Tip of the Day framework enables users to see Eclipse Tips during startup and enable extenders to provide tips for their specific bundles. Extenders are able to provide a TipProvider class that can serve Tip objects. Each Tip can provide a link to a website OR a HTML description and an Image URL. TipProviders are selected based on their importance in the current context. For example, if the Java perspective is open, you are likely to get Java tips. If the PDE perspective is open, you are likely to get PDE tips.